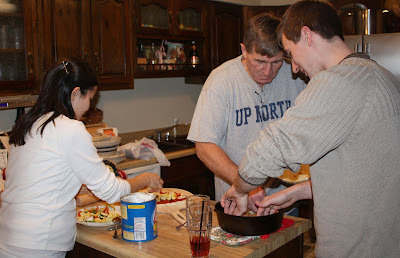 When we were in Illinois we made Chicago Style Deep Dish pizza for dinner. It was so much fun. The whole family got in on the action! My dad makes the best pizza ever! He normally does a regular thin crust pizza, but this time he did his regular AND deep dish! What a treat for us!! He made the deep dish pizza in his cast iron skillet that he has had forever. It is a family heirloom. It was the perfect dish for the pizza! The dough took four hours to rise, but it was well worth it! 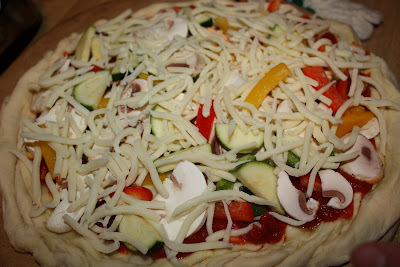 So plan ahead when you want to make this style of pizza! The guys adore their meat, so my dad did an "All Meat, All the Time" pizza...and a veggie for me:) I didn't sample the meat version, but I am guessing it was fantastic since it was gobbled up in no time! The crust was extra thick..it had to be to hold all of the meat, sauce, and cheese! My dad doesn't hold back when it comes to toppings! 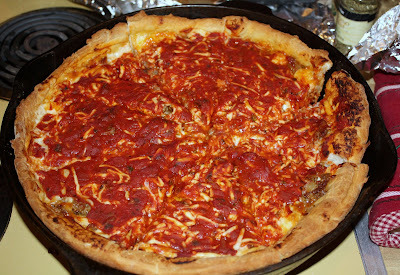 If you haven't tried Chicago Deep Dish pizza...either go to Chicago or make this version at home! It is ultra thick and ultra delicious! Scald milk. Add butter, sugar and salt. Allow milk mixture to cool to "warm." Add yeast and mix thoroughly. In a heavy-duty mixer (e.g., KitchenAid), add milk mixture. 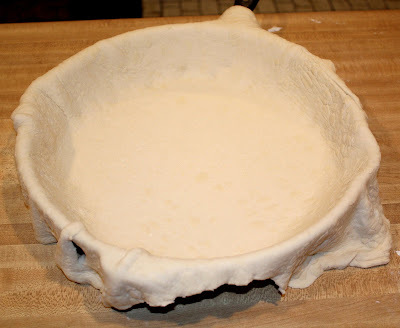 Slowly add flour until the dough pulls away from the side of the bowl and forms a ball. Add water, a little at a time, until the dough combines. Knead dough for 5-10 minutes. Cover and allow dough to rise for 2 hours. Punch down the dough, knead briefly, and allow to rise and additional 2 hours until approximately doubled in bulk. Simmer sauce for 1/2 hour. Using a coarse grater, grate mozzarella cheese. I am not sure how much we used, I just know it was a lot! My family likes their cheese! My Dad used Italian sausage. He seasons it with fennel, salt, and pepper. You can use Whatever topping you like. I used mushrooms, peppers, and zucchini for the veggie pizza! Bake 45 minutes at 425 degrees F or until bubbly! How fun! 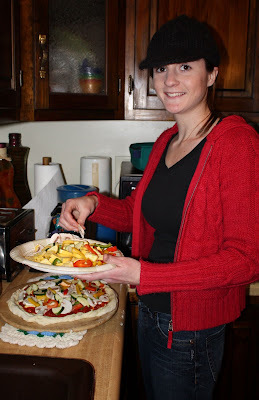 I love homemade pizza- so much better than getting it at a restaurant! Nothing is better then homemade pizza! That pizza came perilously close to the ceiling! Looks like you had a really good time. It's hard to beat Chicago deep dish pies. Wow, those pizzas look amazing. I just had some last night and I am sure it doesn't hold a candle to what you got there! Looks like ya'll had a great time together making pizza. Yum! We do pizza parties too. The veggie one looks like something I would devour! I haven't ever tried a chicago style pizza (I know, being 3 hours from Chicago, you think I would have) but your guys' looks so delicious! Josh has guts, I couldn't get the courage to throw my pizza dough like that. And, your christmas pictures were so cute Maria...you are so pretty! I love deep dish and had no clue what to use as a pan. I don't have a deep dish pan, but have a heavy duty commercial 10-inch pie pan which I'm assuming will work. Great pictures! We make a lot of homemade pizza but I've never made a deep dish at home. I have to try it soon. I'm hungry now. I haven't ever made deep dish pizza, but you've got me wanting to change all that!! Awesome crackers. I need to try those someday. Great Christmas photos! Cute couple and great dad to do all the cooking/baking with you! YUM! I just watched an episode of Bobby Flay's Throwdown on Chicago deep dish! Yours look great!!! You have me changing my dinner plans now! Homemade pizza is the best, they look sooooooo good! My gosh that pizza looks fabulous!! I want a piece right now!! :) Thanks for stopping by earlier. Happy New Year! I make regular flat pizzas every Friday night for the kids but have always wanted to try Chicago style. I even have a pan for it... just a wimp I guess. You have made me want to give it a try, I think the family would love it! Oh wow! Looks so delicious! Since I'm far from Chicago, I'll have to try this version ;)! Happy new year! Fantastic looking pizzas. They are always fun to make. Hi ;) I'm so jealous you have Friday off! I have Thursday off though which is exciting! We have no plans yet! What about you two? YUM! We had deep dish pizza on Christmas Eve. It is the best! 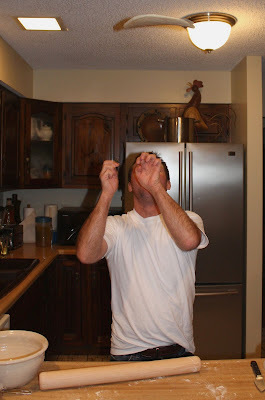 Great pizza dough toss! That deep dish pizza is looking really good! So delicious and so much fun!!! 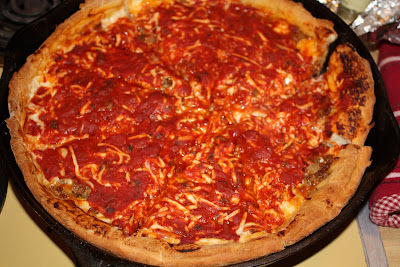 I love deep dish pizza - but I get mine from a place here in Chicago that's not really on the map - it's the absolute best! Yours looks good! Homemade pizza is the best. I love reading stories about you and your family. Happy new year! We have pizza night's at our house a lot. They are a lot of fun. Your pizzas look delicious and the deep dish sounds amazing. I would have been with the boys on that one. The more meat, the better. I'm so hungry now for pizza! I didn't know you could make pizza in a cast iron skillet! That looks fantastic, I'm bookmarking this for next week when I'm on vacation! Yummy-looking pizza, and I love the action shot of tossing the dough! this look awesome delicious, fly me one ! how I wish! if i'm gonna go to a party, i want pizza to be involved. making it all from scratch is even better--looks like a fun time was had by all! What a cool way to get the whole family involved and making dinner. This would also be a great work and team building exercise. I bet Grumpy would love this (as long as I put the Italian Sausage in it!). 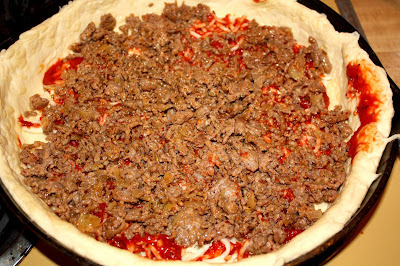 I have never made a Chicago Deep Dish. I think it is about time I tried one!